It's been six months since I've updated my blog, and much has changed. So much, in fact, that the sheer amount of things I have to write about has been preventing me from writing at all! I've resigned myself to the fact that many of this summer's great adventure stories will have to remain untold, and that I will just have to tell the biggest story - and in the spirit of 'worth a thousand words', I think the story is best told as a series of photographs, with a descriptive paragraph for each. There are eighty-six photographs in total, and that's after having culled and cut and edited out well over half of them. Most of these photos are lower quality, all that remains from my iPhone's 'Facebook' application. Without further ado, I present to you "What I Did On My Summer Vacation", the June edition. If you're reading this on Facebook, I strongly suggest you visit my main blog site (http://www.disengage.ca) for the original formatting. 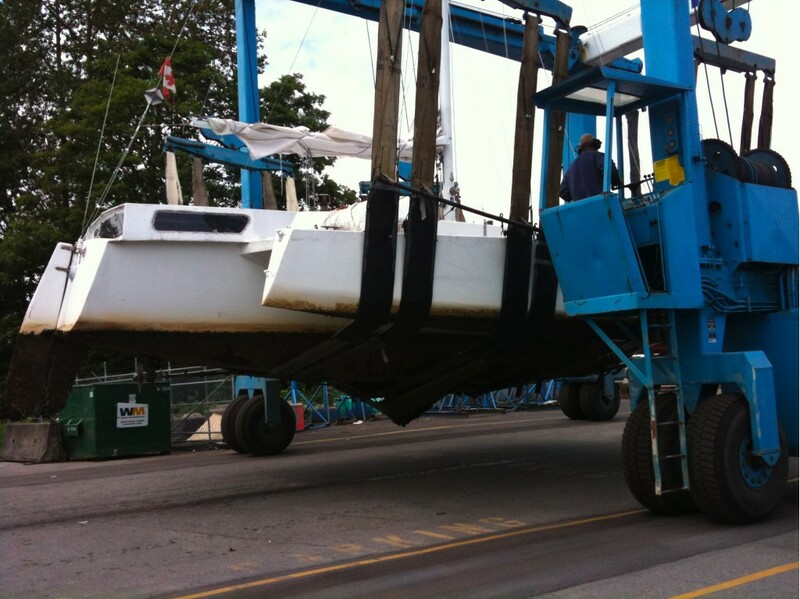 Given the ongoing problems with my engine overheating, I figured it was probably prudent to enlist some help with the travel from Kitsilano up to the boatyard that I'd be working in, Shelter Island Marina in Richmond, BC. They were chosen because they are the only boatyard in the lower mainland with a travelift capable of hauling out a boat the width of Tie Fighter! 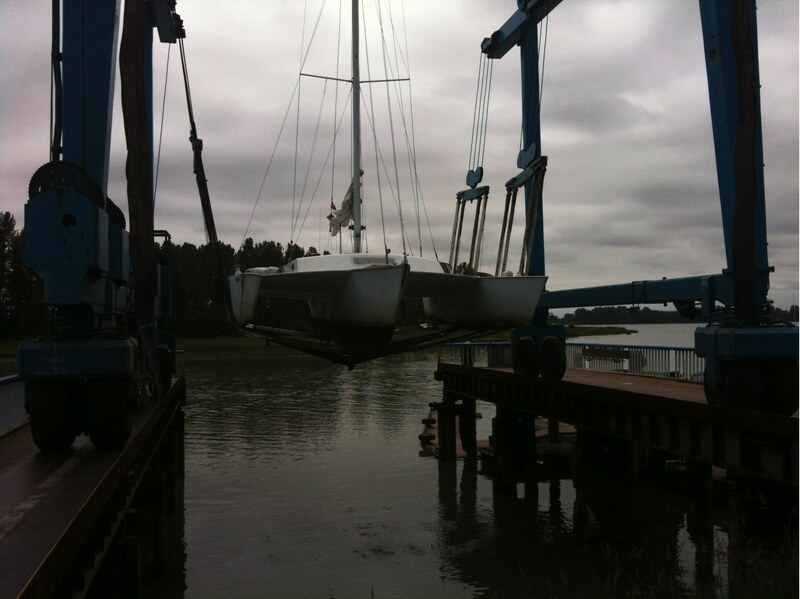 My friend John Foulkes offered to give me a tow up the Fraser River with his powerboat, and so Ernst and I sailed Tie Fighter out around UBC and to the river mouth, then attached a line to John's boat (the Foulkeswagen) and headed up the river. 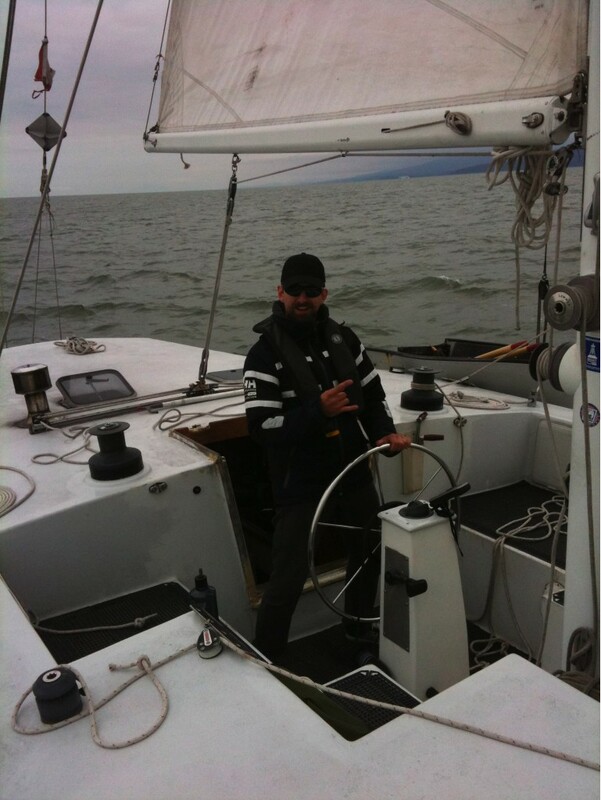 Aside from a near miss of the banks during a daring coffee-relay mission between the two vessels, the trip was peaceful and uneventful. ...finally set down gently on metal stands, ready to be worked on. At this point I honestly did think that I'd only be out for a total of two weeks, but everyone who asked about it laughed when I told them my schedule and predictions of how long it would take. One guy, a fellow geek, actually recommended I take all my predictions regarding time and money to be spent, add a worst-case scenario, and then multiply it all by 'pi'. Strangely his predictions were the most accurate of anyone. 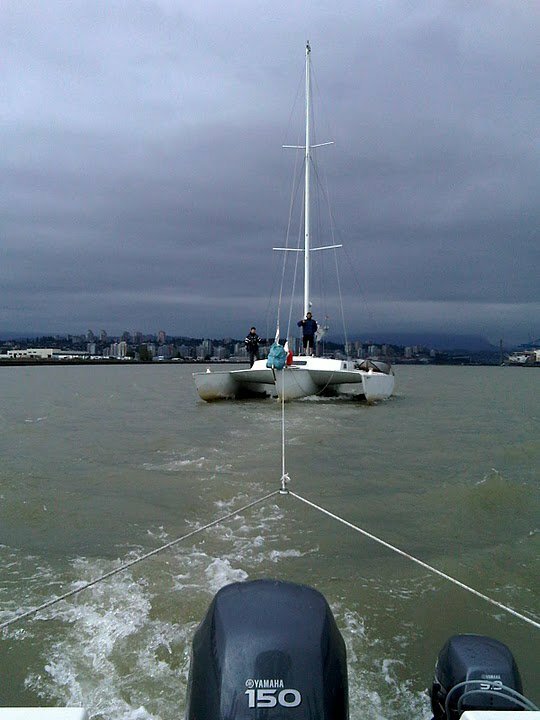 The first task was to remove the centerboard, though of course it didn't want to come out. 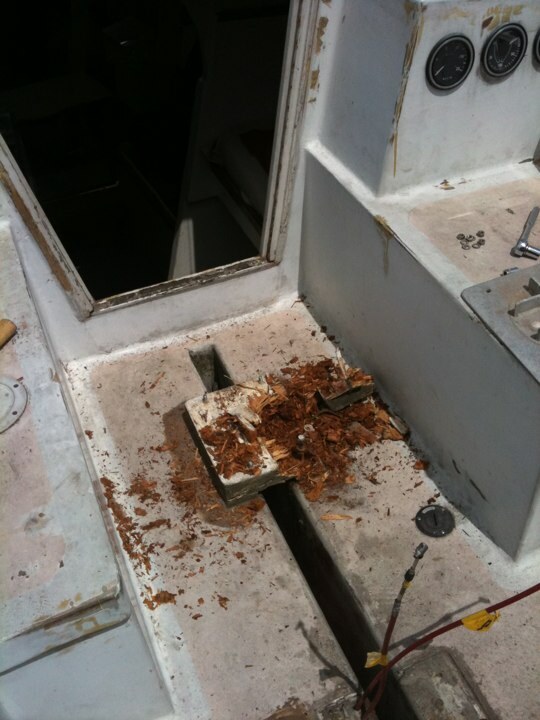 At some point, some previous owner hit some rocks and damaged the fiberglass bottom edge of the board - the wooden centerboard absorbed seawater and swelled up, causing it to stick in the centerboard trunk. Two days, a lot of rocking, some serious leverage provided by halyards and block-and-tackle, and a bottle of extra virgin olive oil later... she came out. 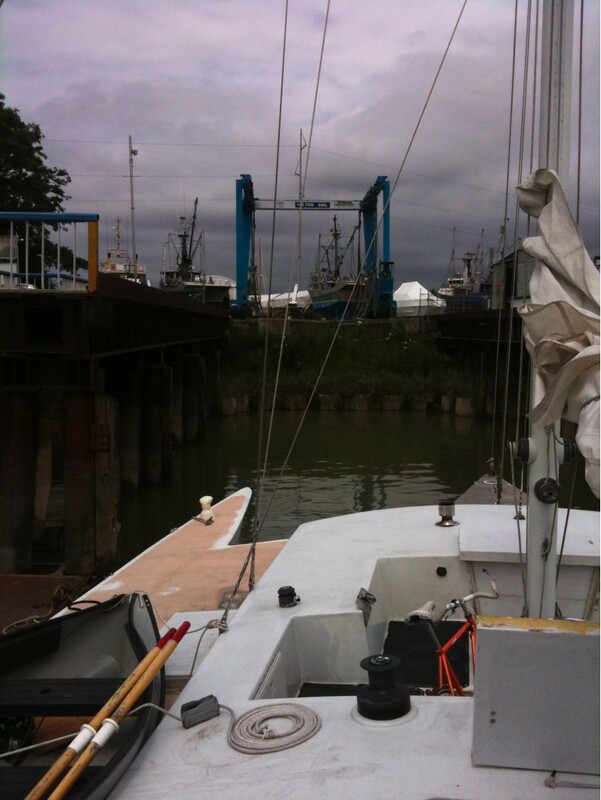 Six hundred pounds of centerboard doesn't move around too easily! 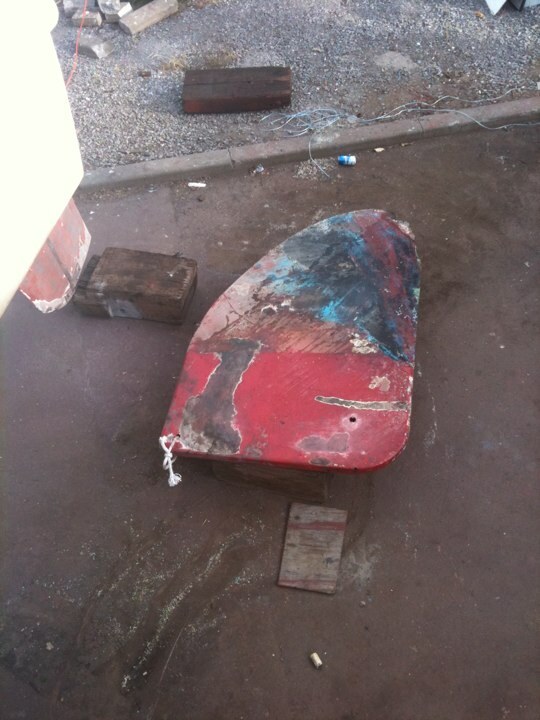 Ugh, three different layers of anti-fouling paint, old fiberglass, wood fibers and several years of marine growth - this piece of wood was foul. 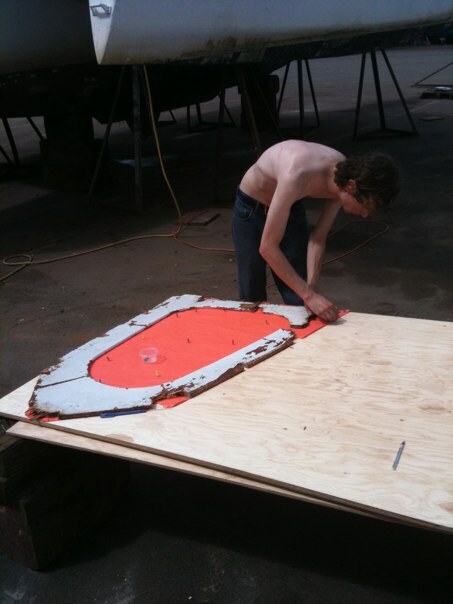 We drilled a bunch of drainage holes in the board and propped it up on wood blocks "for a few days". Little did we know, it would be there for almost two months. 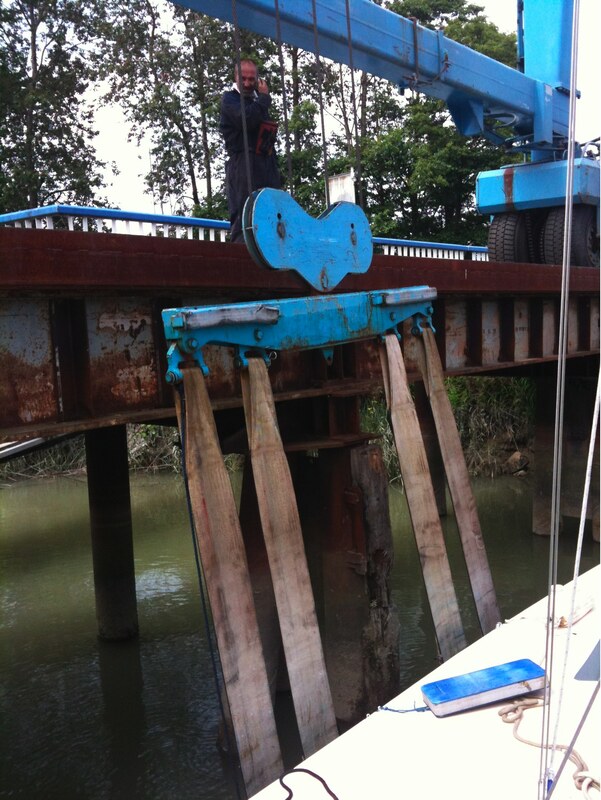 One of the first major projects was to repair a "tiny, little 6-inch spot of rot" in one of the port ama bulkheads. 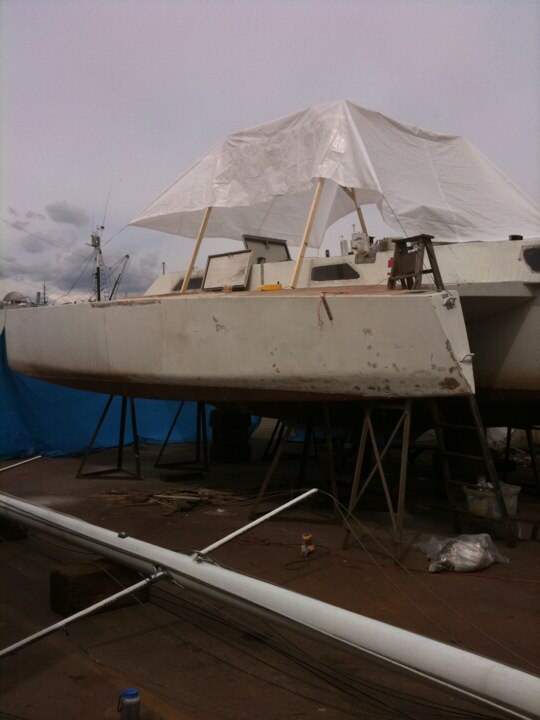 Of course, we quickly learned that as soon as you can spot any rot, there's a lot more that you can't see... and the project turned into a bulkhead, support beams, an inside panel and several feet of decking! 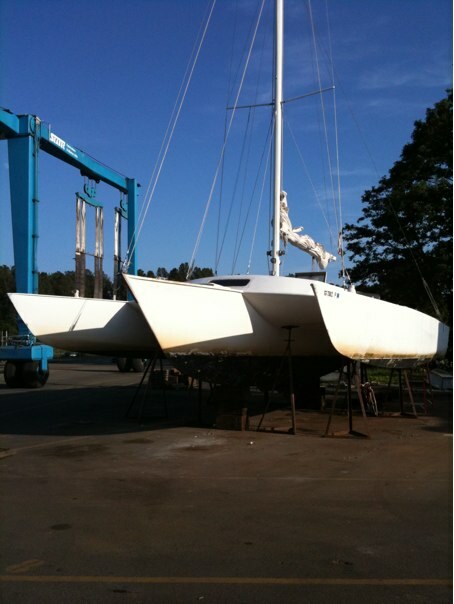 My close friend Dan Ross spent a large portion of the summer out in the boatyard with me, helping to repair the boat. His work ethic and good humour kept me both motivated and sane through the long, hot days on the asphalt. In the photo above you can also see the line locker, the open hatch on the right. Originally this had been a locker for a life raft, accessable from below the wing should the boat ever capsize... but of course, the hatch wasn't installed well, and subsequently it rotted. 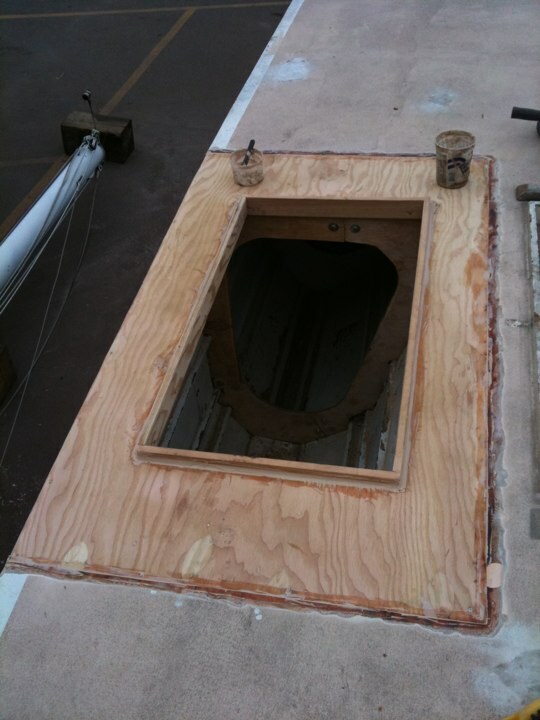 We removed the hatch and built up the locker as a proper watertight line locker, by replacing about fifteen square feet of the underside of the wing, then building a new floor into the locker over top of that. 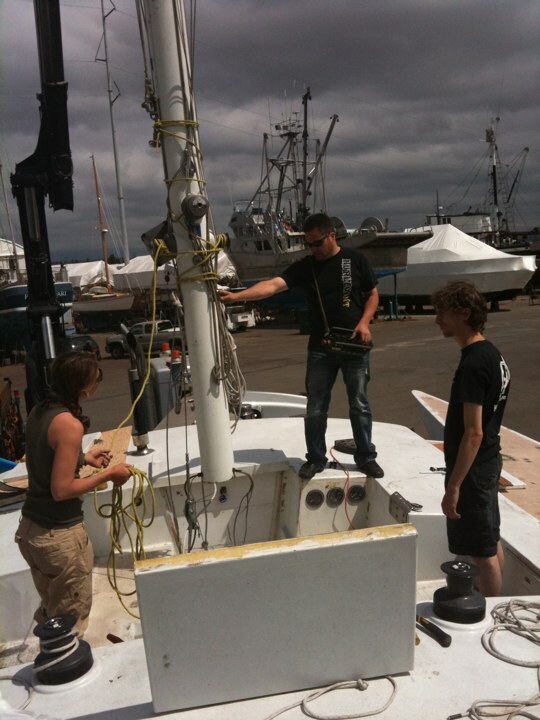 During this time I also had other friends visiting and helping quite often - here's a pic of my lovely girlfriend Miya working on the starboard bow. 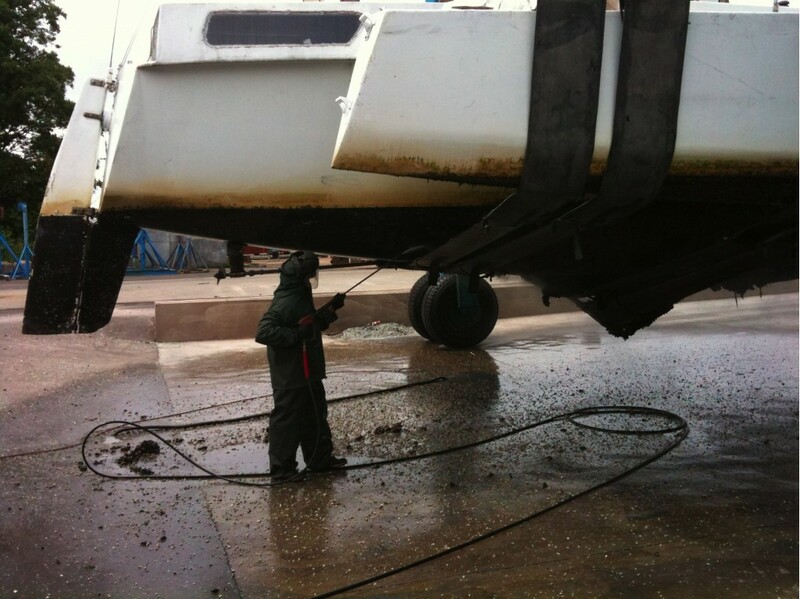 At first we tried to remove the old anti-skid paint with sandpaper and then with an angle grinder, but the sheer amount of work to do so was staggering. In the end, we found that methyl ethyl ketone (MEK) was the answer - the anti-skid paint dissolved under the solvent! 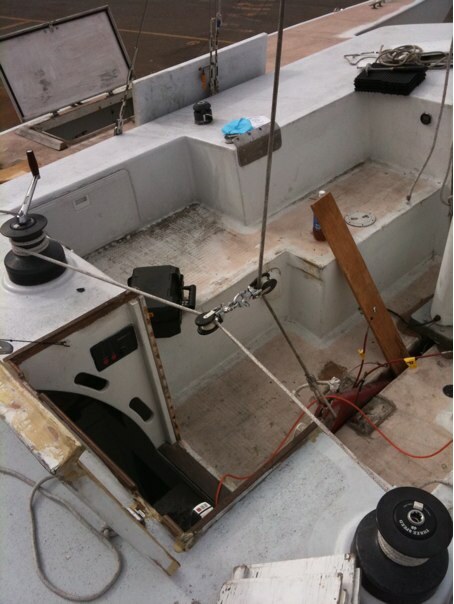 lots of rot in the mast step! 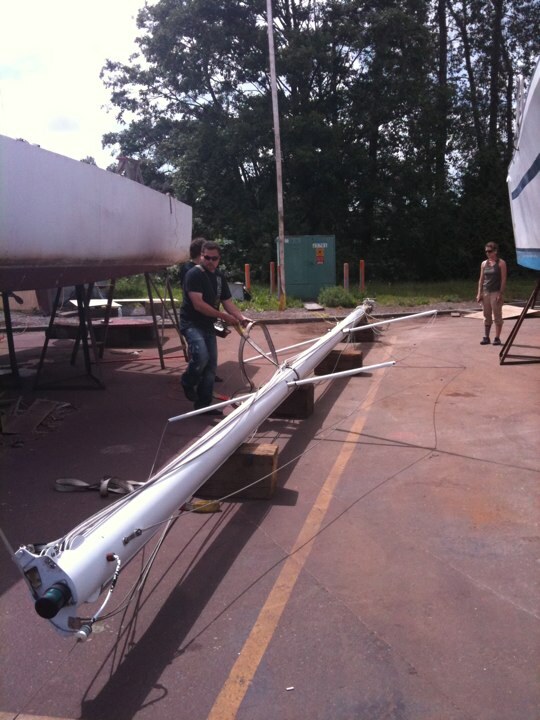 Above you see the mast step, which essentially collapsed as soon as I applied a little pressure to it. I'm very fortunate that it never collapsed on me while I was at sail, though I'm pretty sure that I would have had problems if I'd left this project for another year. As the Canada Day weekend approached, bringing June to a close, the weather forecast showed a prediction of rain. With a quick run to Home Depot for lumber and a tarp, we built a rain cover over the worksite - which had the side effect of giving us some much-needed shade on what would prove to be the hottest days of the summer. 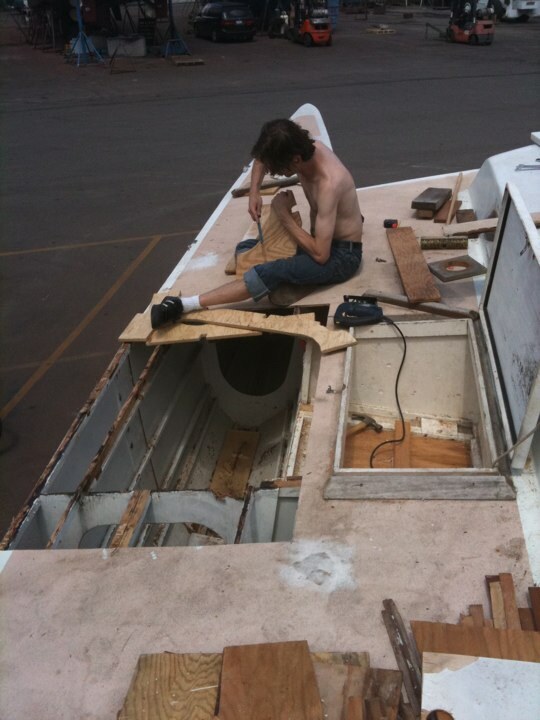 Oh my god, I had no idea boats were so much work! Thanks for the update! News From The Front » « Ok. OK!